A beautiful keepsake Christening Bib. Sure to become an heirloom. Each bib has detailed cross and a soft cotton backing. 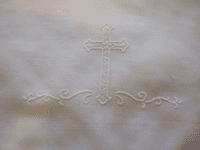 Embroidery will be done in white thread for a subtle look. 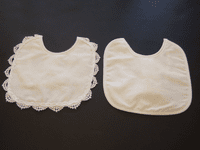 Bibs should be handwashed and line dried to maintain keepsake.